Pacific Partnership is the largest multinational humanitarian exercise, the embassy says. 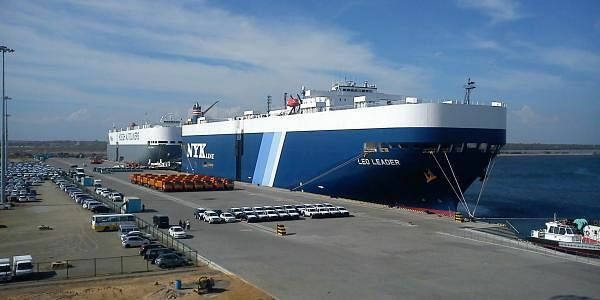 COLOMBO : The US Pacific Fleet symbolically moved into the strategically located Hambantota port in South Sri Lanka on Monday, beating China in the race to establish great power presence in the port and the region. The US embassy here announced on Monday, that the Pacific Fleet’s transport ship USNS Fall River will be on a Pacific Partnership goodwill mission to Hambantota and its environs from March 6 to 18. Military and civil personnel from Japan, Australia and Sri Lanka will be holding joint exercises through the 12-day mission. Though touted as a humanitarian or disaster relief exercise with the Sri Lankan, Australian and Japanese navies, the choice of Hambantota port for holding it, and the partnership with critical regional allies, give the mission a unmistakable security dimension. The embassy statement says that the multinational effort includes free community health clinics; school and hospital renovations; learning exchanges for medical and disaster-relief responders; seminars to promote women’s roles in peace and security; and public performances by the U.S. 7th Fleet Band. “Through this Pacific Partnership mission, the United States will continue to help Sri Lanka respond more quickly to humanitarian challenges. At the same time, our Sri Lankan partners will share with us their valuable lessons learned from past natural disasters,” the statement quotes U.S. Ambassador Atul Keshap as saying. “Our time in Sri Lanka is about building relationships and the capability and capacity to work together for the future,” added Capt. Stanfield Chien, Commander of the mission. Significantly, the places earmarked for the fleet’s activities fall in the pocket borough of the former pro-Chinese and anti-American Sri Lankan President Mahinda Rajapaksa who is now a key political player as a leader of the Joint Opposition Group. Having constructed the Hambantota port at a cost of more than a billion US dollars, China is poised to take over the port through a debt-equity swap in which it will get 80 percent stake in the port for 99 years. But the US and India have been concerned about the possibility of the port’s being used to support China’s military and strategic plans in the Indian Ocean region. America’s decision to hold the US Pacific Fleet’s humanitarian Pacific Partnership Mission at the Hambantota port, in association with strategic regional allies Japan, Australia, and the current pro-Western Sri Lankan government, could help forestall attempts by China to get control of port. The Hambantota port is currently embroiled in a controversy over the extent of China’s stake in it. The Joint Opposition led by former President Mahinda Rajapaksa is opposing the deal totally, and Ports Minister Arjuna Ranatunga is seeking the replacement of the 80% stake by a 65% stake. President Maithripala Sirisena is looking into the issue to see that Sri Lanka’s interests are not affected. The controversy has delayed the finalization of the agreement. And this has come in handy to powers which do not want China to get entrenched in the port. When Rajapaksa was President in 2005-2014, he lurched towards China to the discomfiture of the US and India, He gave the Chinese, multi-billion infrastructure projects including the contract to build Hambantota port. Rubbing India on the wrong side, two Chinese diesel-powered submarines berthed at a Chinese-run terminal in Colombo port from September 7 to14 2014. This almost coincided with the visit of the Chinese President, Xi Jinping, to Sri Lanka on September 16 and 17. On November 6, 2014, a nuclear submarine called at the same Chinese-run terminal even though in September, New Delhi had protested. The then Sri Lankan navy chief Adm.Jayantha Perera declared that Sri Lanka would not allow anything that compromises India’s security, but cabinet minister Anura Priyadarshana Yapa categorically stated that Colombo will not talk to New Delhi on this issue. New Delhi was irked because Sri Lanka was ignoring the India-Sri Lanka Accord of 1987 which enjoined Colombo not to let any foreign power use its ports and other facilities against India’s interests. Although India is not part of the on-going Pacific Partnership in Hambantota, it is keen that the port does not fall into the hands of the Chinese in a way that will pose a security threat to India. Japan, which is struggling to ensure freedom of navigation in the face of Chinese obduracy in the South China Sea, is keen to see that the Western Indian Ocean does not come under Chinese hegemony to pose a threat to navigation. As an ally of the US, Australia shares America’s concerns vis-à-vis China in the Asia-Pacific region.